Cape Town - The ANC's national minimum wage policy is causing chaos in the engineering sector, the National Union of Metalworkers of SA (Numsa) said on Friday. "We warned the ANC that the National Minimum Wage they had proposed would have disastrous consequences, but they arrogantly ignored us. Now their proposal is causing chaos in the engineering sector by ensuring that workers who fought to earn more, now risk being downgraded to this pathetic poverty wage of R20 per hour," the union said in a statement. "At the end of the day, the ANC will always fight to protect big business and white monopoly capital at the expense of workers and their families." According to the union, a strike looms in the engineering sector after wage talks with employers in the sector failed. Numsa rejected the latest offer from employers. The union said its demands remain the same. These include a 15% wage increase across the board based on the actual rate a worker is earning, and not on the minimum rate. It wants a two-year agreement and the increase to be backdated from July 1 2017. The 15% wage hike demand is almost three times the current inflation rate in SA. It further wants the agreement to be extended to non-parties as well - including associations like the National Employers' Association of SA (NEASA), which actually falls under the Metal and Engineering Industries Bargaining Council (MEIBC). According to Numsa, the employers want to increase wages in terms of the minimum rate according to the ANC's national minimum wage policy, instead of what the worker is actually earning. "Employers want to implement a minimum rate of R20 per hour for new entrants to the sector, when the minimum is R40," Numsa said. "Employers want us to recognise the Plastics Negotiating Forum as a chamber of the MEIBC. They want it to be excluded from the main agreement." Numsa claims the agreement proposed by employers will make working conditions worse. "Employers are lying when they say that those who earn more will not get downgraded. We know that in reality, there is no one to stop them from paying workers half of what they should earn. If we were to agree to this ridiculous proposal, then new workers will suffer and those already employed will earn less than what they are earning now," said Numsa. 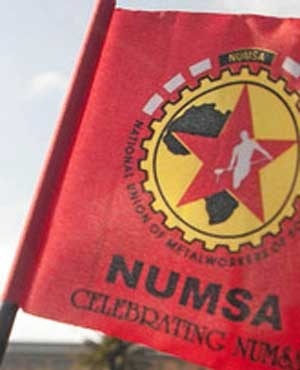 Numsa has requested a certificate of non-resolution which will allow it to go on strike. It now has to wait until July 15 to see if it is granted. "We will not back down and we will not be bullied. We will fight with all our might to protect the rights of our members and their families, and to ensure a life of dignity for them," said Numsa.